$Gold trading just above $1318/oz around noon in a very sunny spring London today. 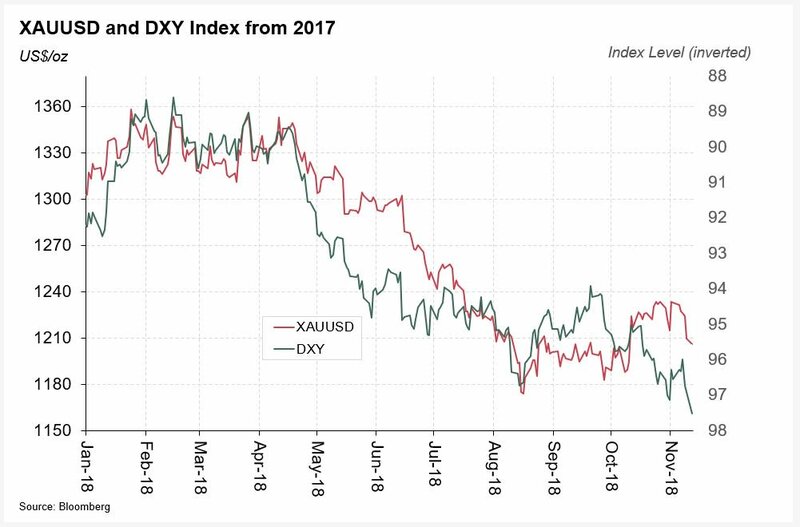 Gold: Despite the recovery in price from the early-in-the-month weakness, #gold has not seen any large (identifiable) investment flows in March. 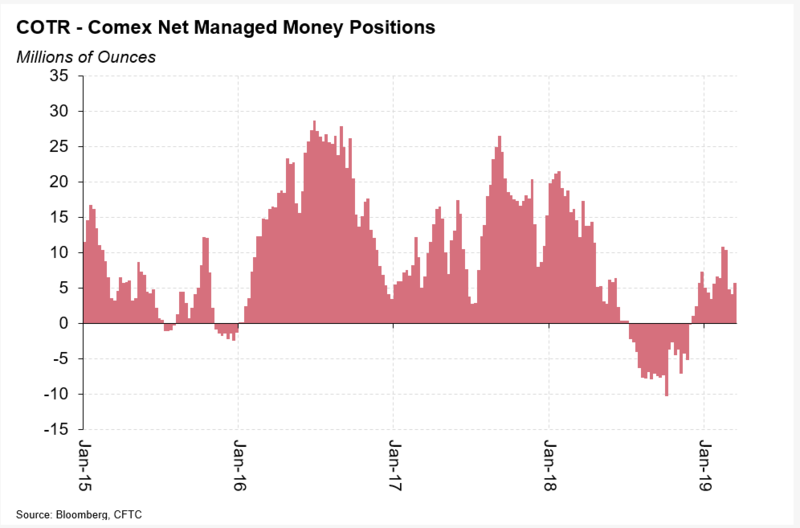 The COTR for gold showed only a small increase in net long managed money positions to 5.8moz as of last Tuesday. #Gold: Although this may have changed after three decent days of Comex volume Wednesday-Friday last week. Gold: I’ve been out of the office for a fortnight due to a holiday and some business travel and have missed much of the move lower. 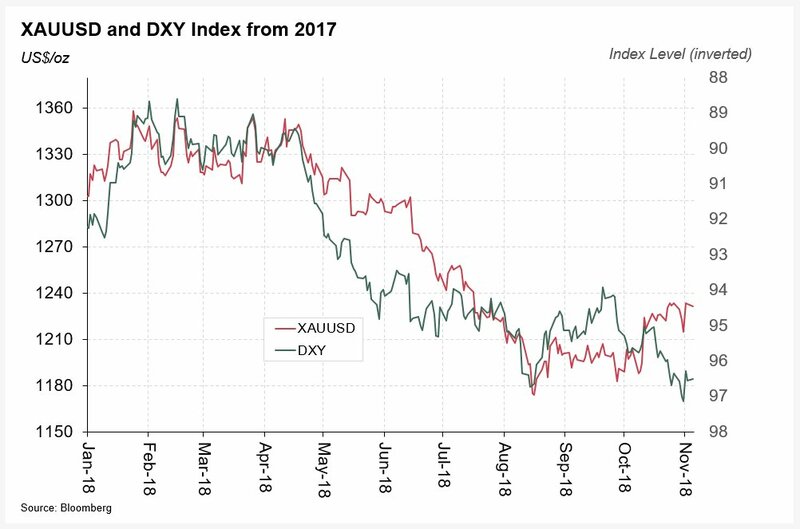 #Gold’s decline doesn’t appear to be due to a large strengthening of the US dollar. 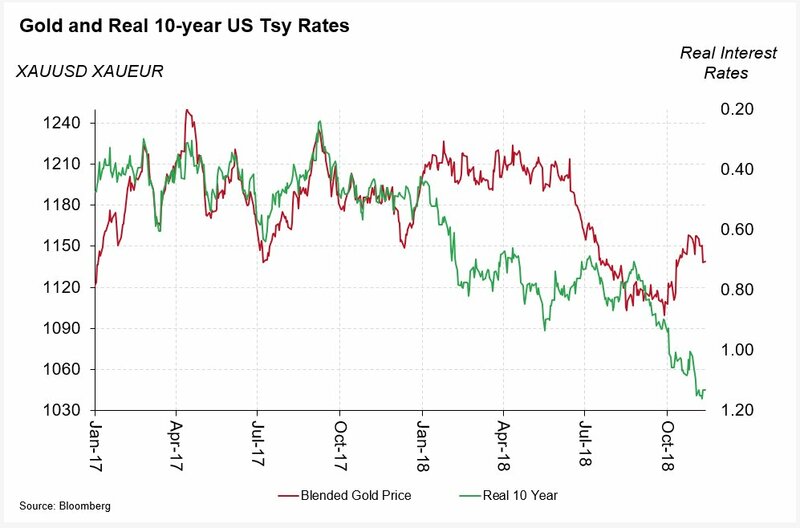 Gold: Nor is the sell-off in #gold due to a large move in Real US Treasury Yields. Gold: We've seen dollar-denominated #gold soften a little since the start of February, as this chart shows. Gold: The major driver of this weakness in #gold was the strength of the US dollar, which looks relentless on this one-month chart. 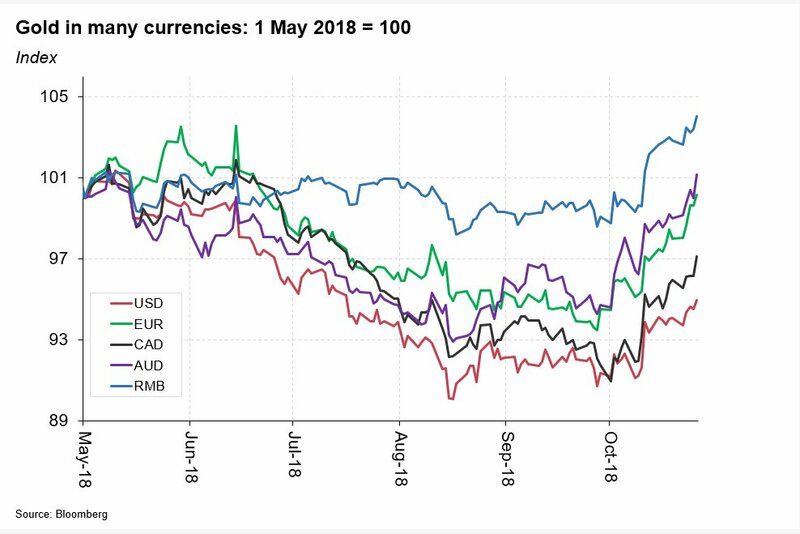 Gold: ...and this is reflected in #old's performance against other currencies which generally have not seen the same softness since the beginning of February. #gold is pushing higher in European trading on Tuesday morning, last at $1307/oz. The US dollar remains nailed to the lower end of its recent range and US S&P500 equity futures are (slightly) lower, not shown here. #Gold is trading around $1300/oz at noon in the UK on Monday, holding onto most of Friday afternoon’s gains. 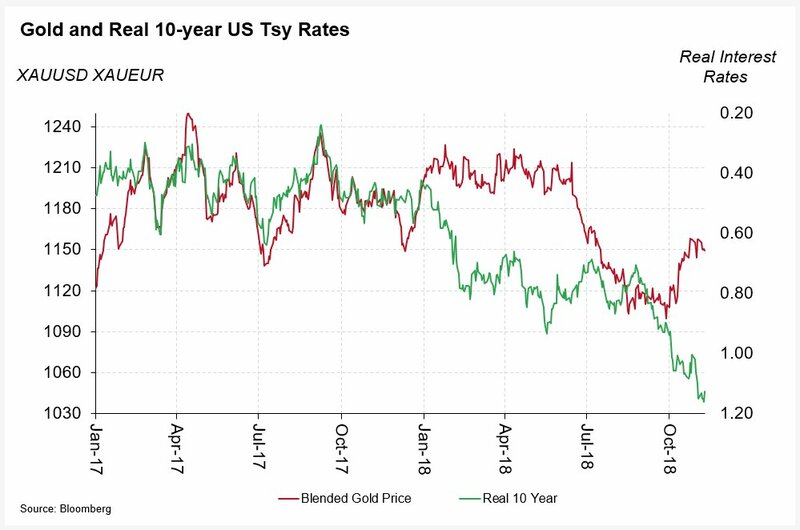 #Gold: As a reminder, we believe these gains come after a Wall Street Journal article suggested an early end to Fed balance sheet shrinkage (paywalled). 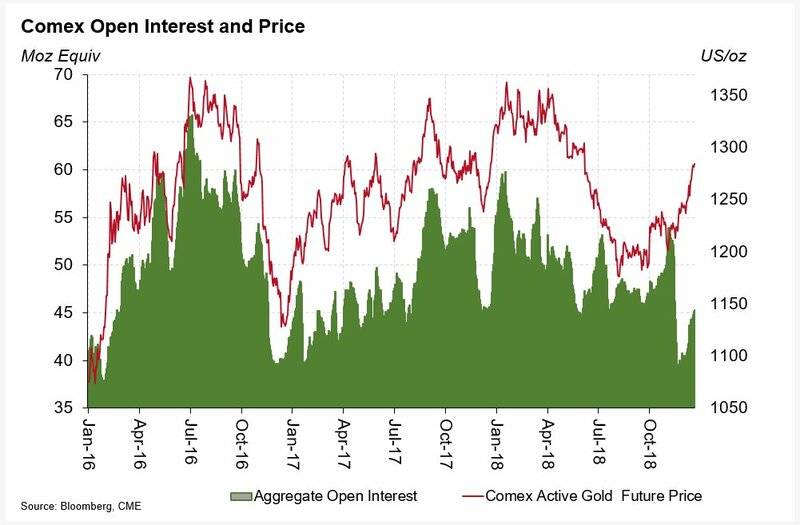 Gold: Comex #gold open interest increased by 1.5 million ounces on Friday, suggesting more new longs than covering shorts. 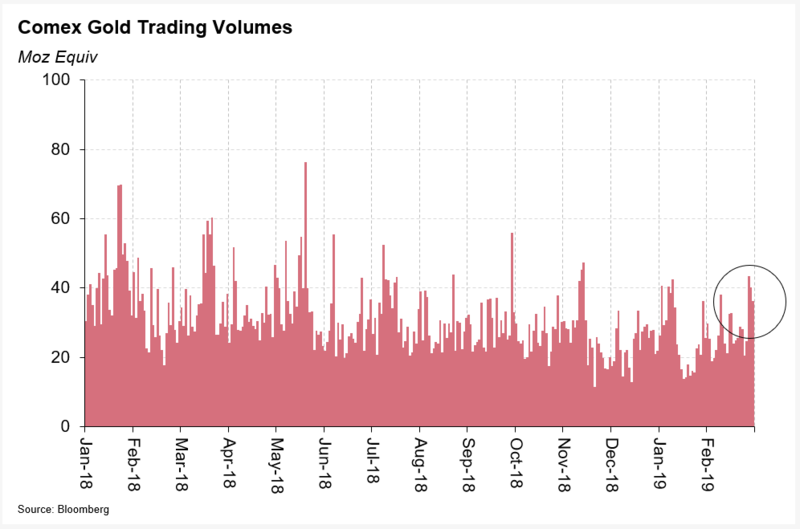 Some modest inflows were reported by the ETFs too, but less than 100koz. 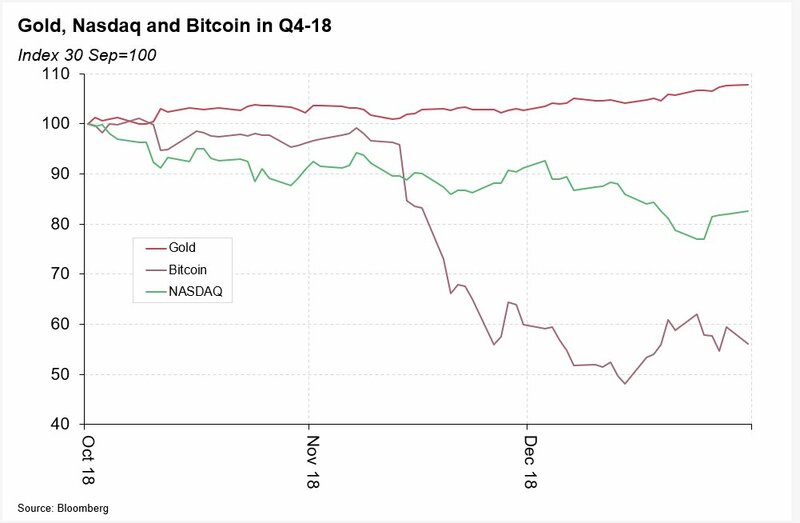 One of my colleagues, Adam Perlaky, manager of investment research for @goldcouncil in New York, put together a summary of how gold, NASDAQ and bitcoin performed in the Q4-18. 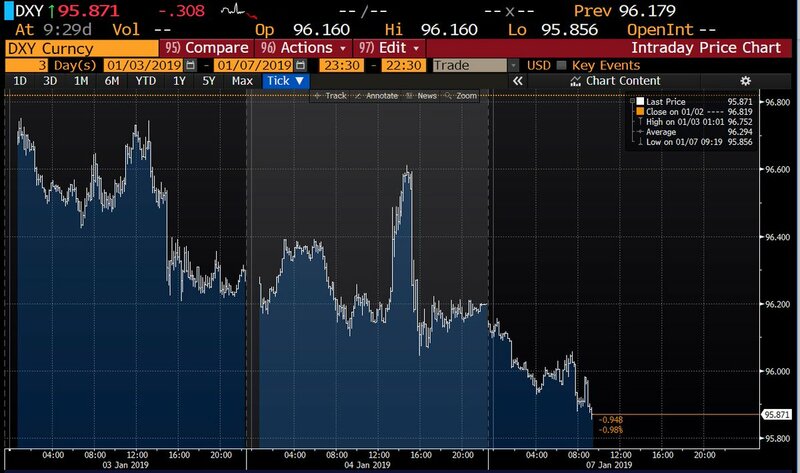 It was a period of equity market weakness and we wanted to see any evidence of bitcoin behaving as a safe haven - one of the supposed reasons for holding the cryptocurrency. 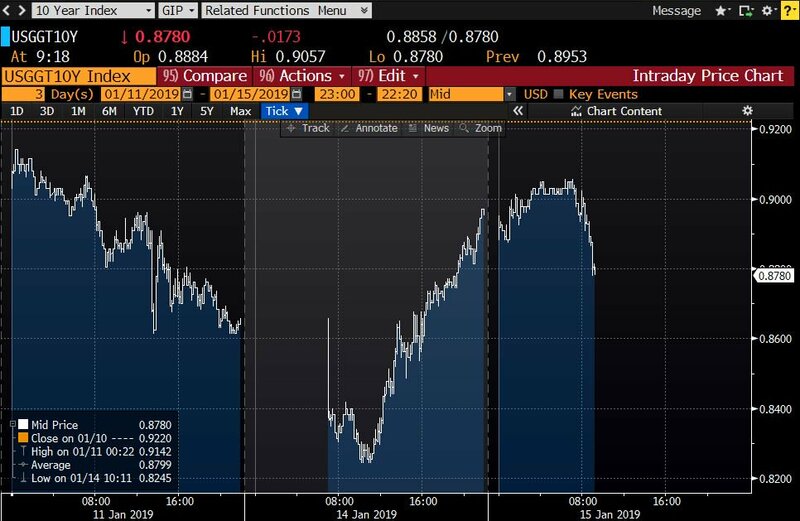 Simply put, the price was highly correlated with the Nasdaq (69%), while the Nasdaq was negatively correlated with gold (-73%). Crypto behaved like a risky asset, specifically like a speculative tech stock. 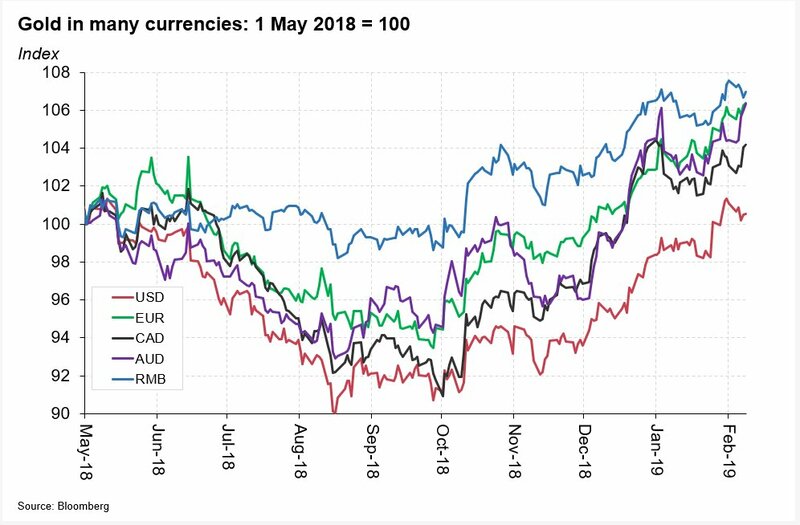 Gold: On a slightly longer term perspective, #gold's rally has run out of steam in other currencies too, giving back aof the past few months gains. Gold: Finally, #gold held by ETFs declined fractionally yesterday but the amounts were minimal. As a side note, I'm going to stop daily reporting of gold held in ETFs unless the change is big (positive or negative) or we get a decent trend of selling / buying. 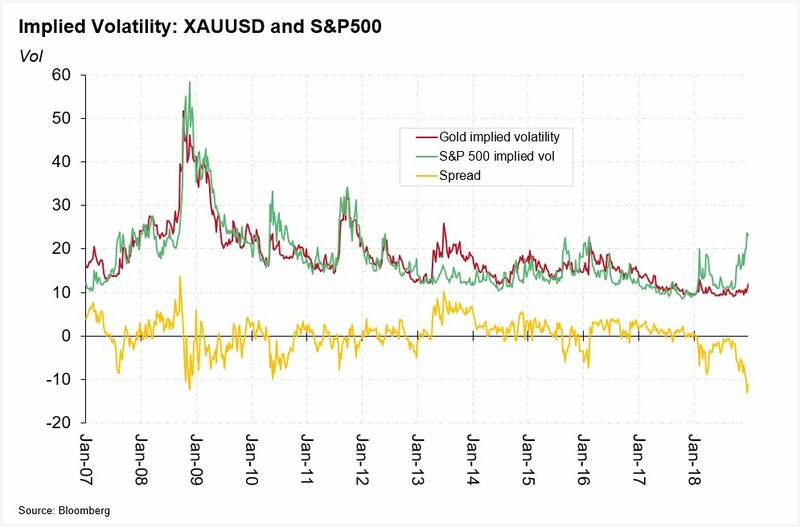 Gold: My colleague in New York, Adam Perlaky, drew my attention to the fact that Implied volatility of the S&P500 is trading a lot higher than that of gold/dollar (90 day vol). 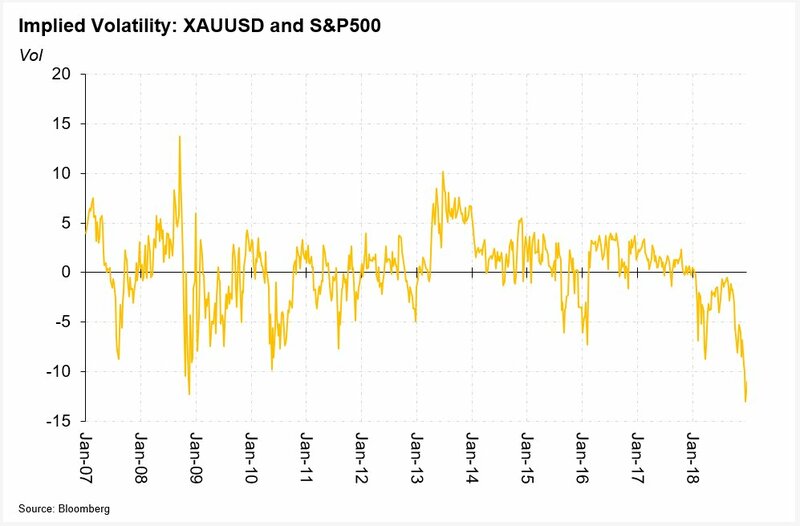 Gold: That's not that unusual, as this chart shows - visually the volatility of these two assets seems similar. 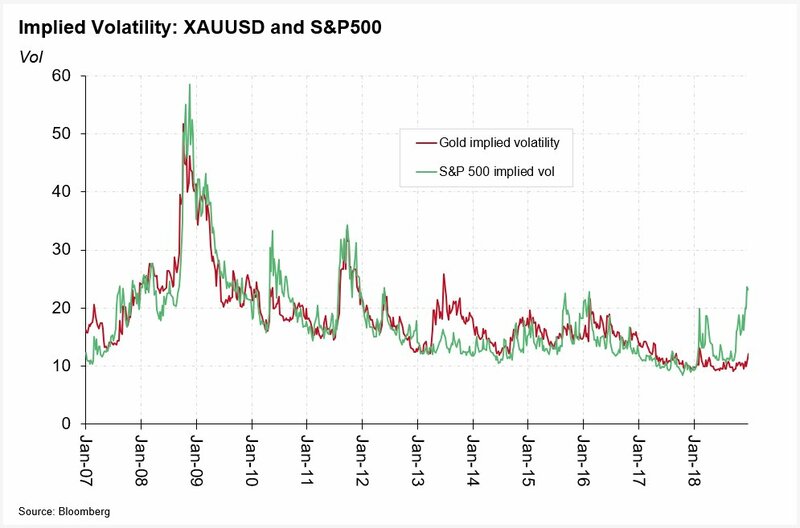 But the discount of gold vol to S&P500 vol is at a high (back to 2007) and that suggests something unusual is going on. 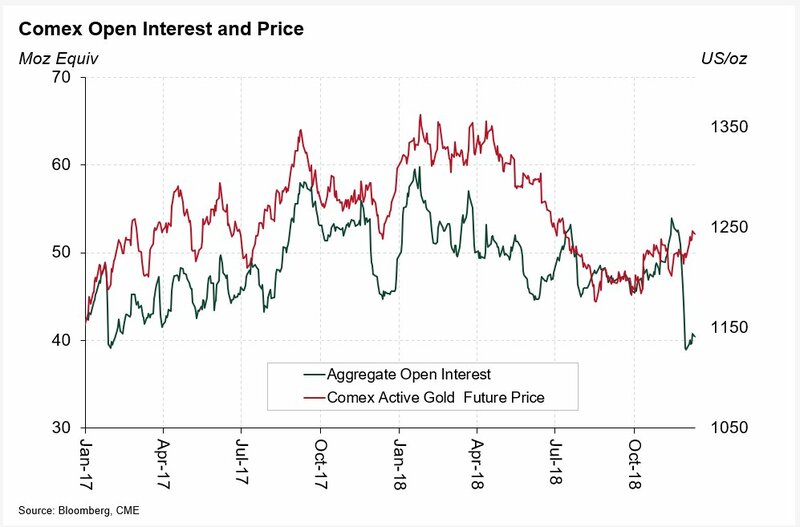 Gold: Options buyers are MUCH more worried / excited by the potential for a big move in US equities than they are in gold. 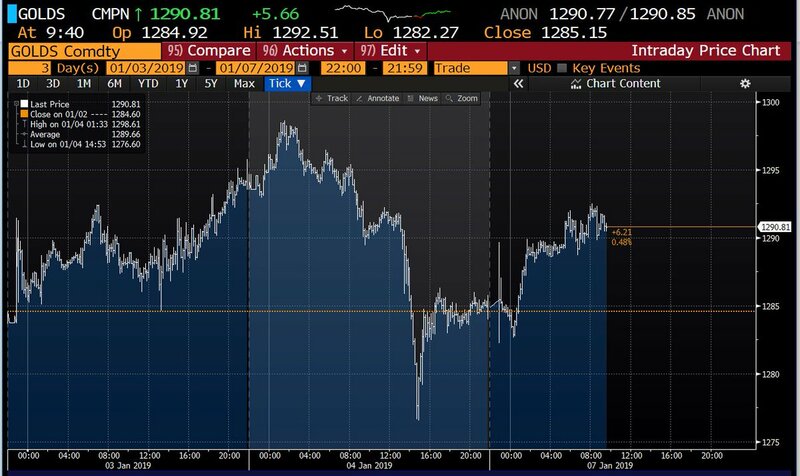 Gold is trading quietly today at 1290/oz. 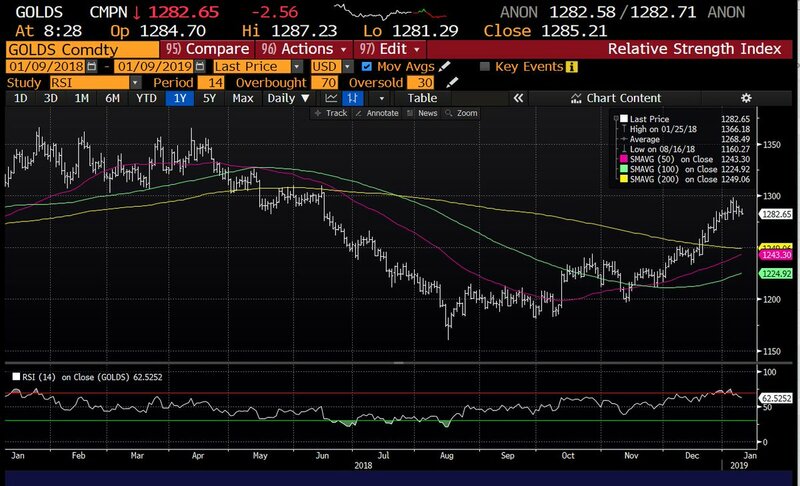 The RSI, at 63, is in positive but not overbought territory and my colleague, Jaspar Crawley, points out that the spot #gold price has made a golden cross, with the 50-day crossing the 200-day (and with positive spot momentum). 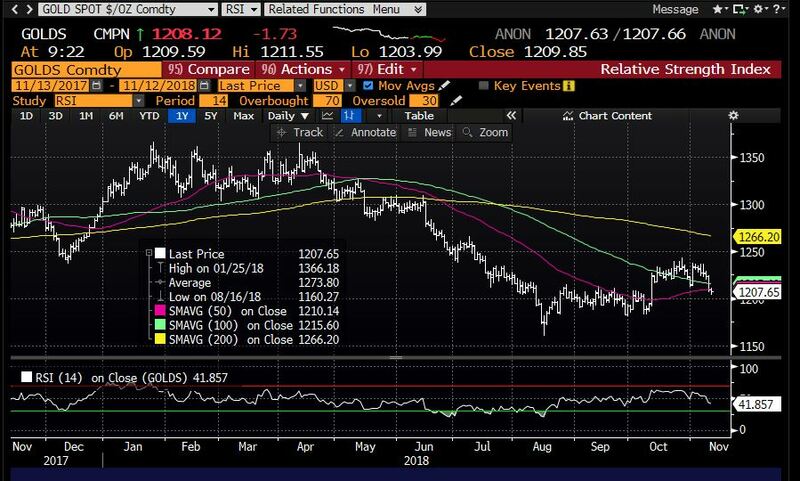 Gold: Jaspar suggests that this may trigger some momentum buying in #gold but I wonder whether the active Comex future (Feb) is more important and the golden cross in this is still some way away. 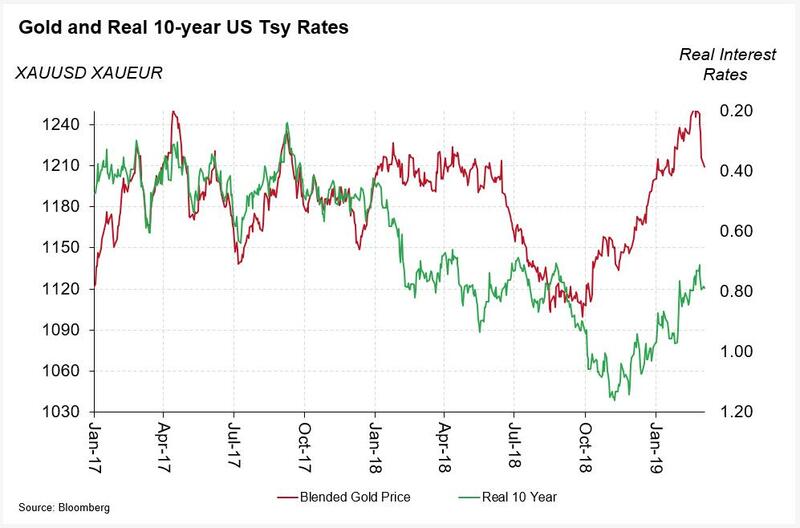 Gold: I hardly ever mention the B word (Brexit, not bullion or bars) because I don’t think it matters for the global #gold market and yesterday’s lack of reaction is a partial justification for this stance. Gold: Trading around $1288/oz, #gold is a little softer Tuesday in European morning hours. Gold: ...while on Tuesday US Dollar strength has kept #gold on the back foot. Gold: Good morning. #Gold trading around $1294/oz in European hours on Monday. 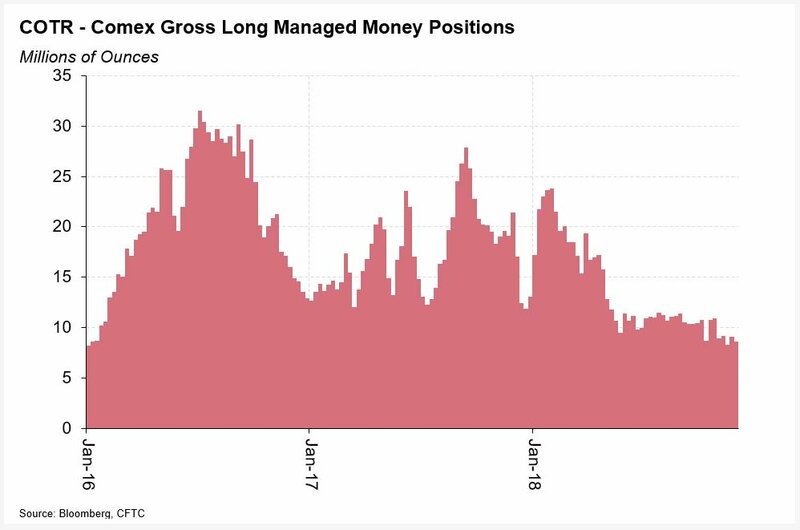 Gold: No CFTC data, as has been the case since 18 December due to the government shutdown, but we estimate that the net long Managed Money position in #gold has probably increased by 2 million ounces to 8.5moz as of Friday. 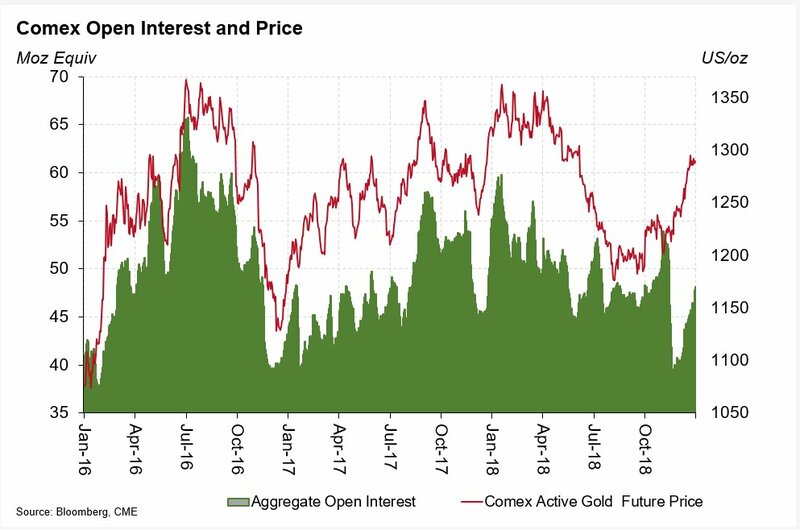 This is from an examination of changes in Comex open #gold interest and price moves. Although OI has increased quite a lot, I suspect some shorts have entered the market over the past week, as well as some new longs. 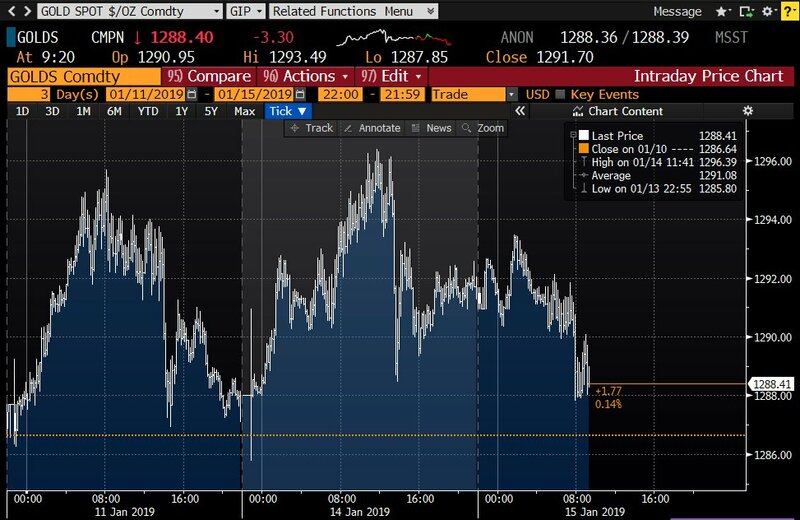 Gold: Bit of a groundhog day today, gold at $1283/oz, slightly weaker in Asia trading overnight after talks of 'good progress' on US-China trade talks. US Equity futures modestly green and ETFs added gold again, now the eight straight day. 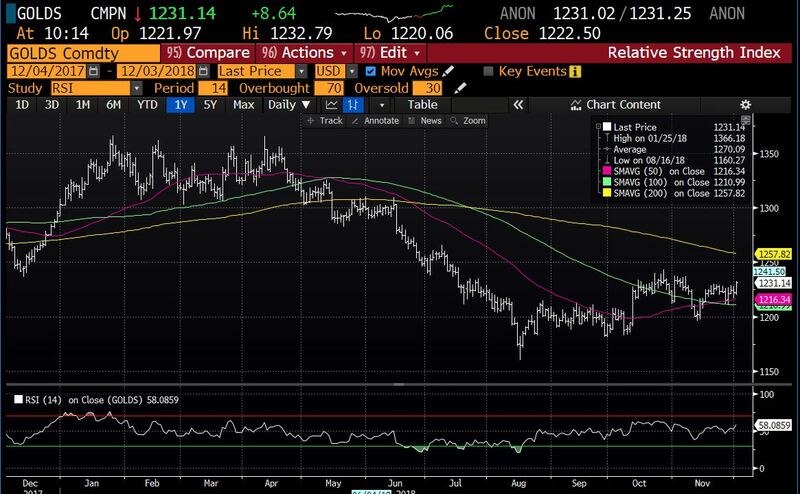 Gold: my technical analysis-minded frieds have noted that gold had done a lot, quickly, and that it would be healthy if the market saw a period of consolidation to let the RSI come lower - perhaps what's happening now is healthy. 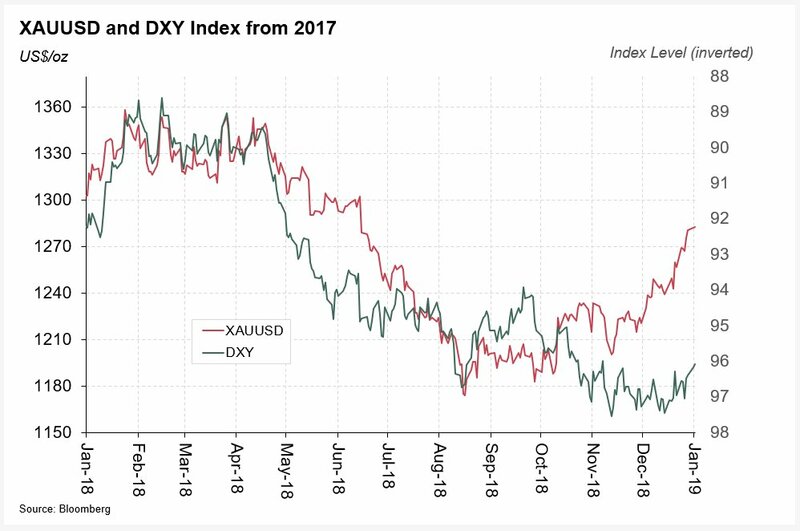 Gold: Back in the office for the first time since before Christmas, its time to look back on #gold's recent performance and what may lie ahead. Gold: the recent strength in gold has been helped by some weakness in the US dollar. 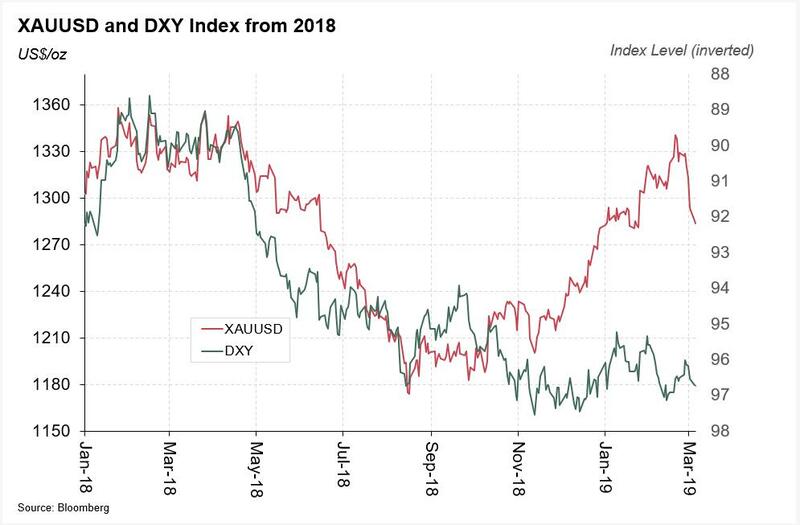 But as this chart shows, #gold has run ahead of the weakening dollar. 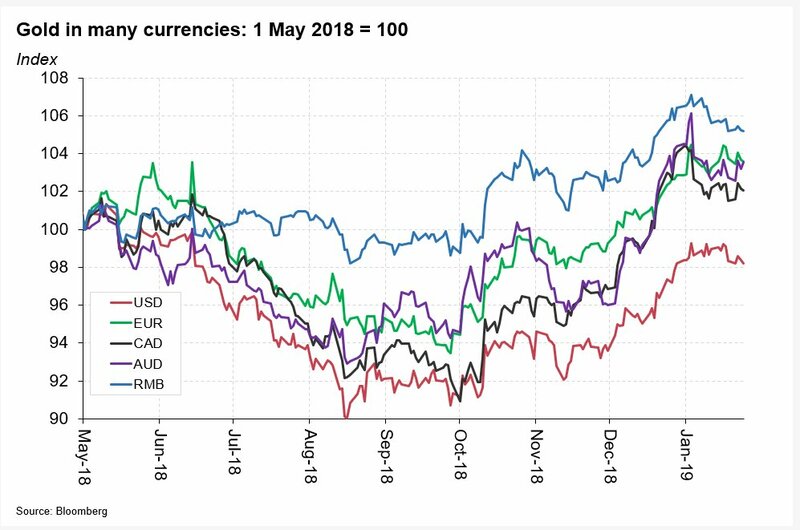 Gold: plotting its performance in a number of currencies is another way of demonstrating that the dollar has not been the only factor lifting #gold. 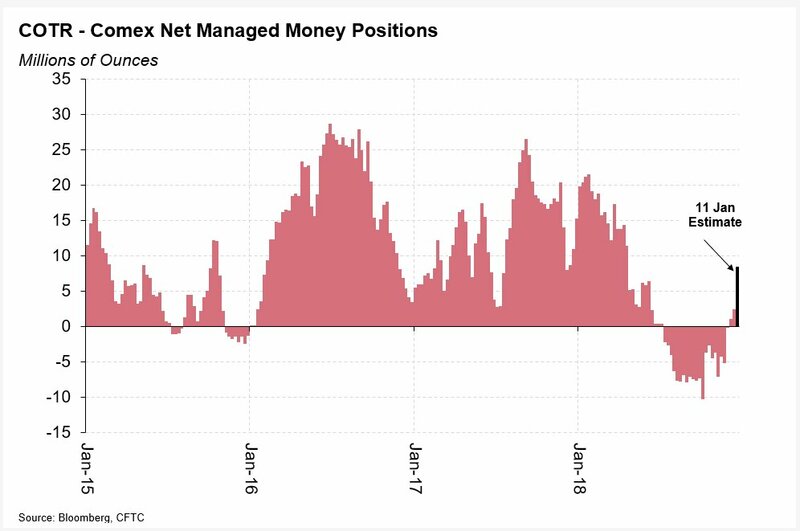 Gold: The COTR for #gold, released on Friday, for positions as of last Tuesday, show that the Net Managed Money position flipped back into positive territory for the first time since 10 July. 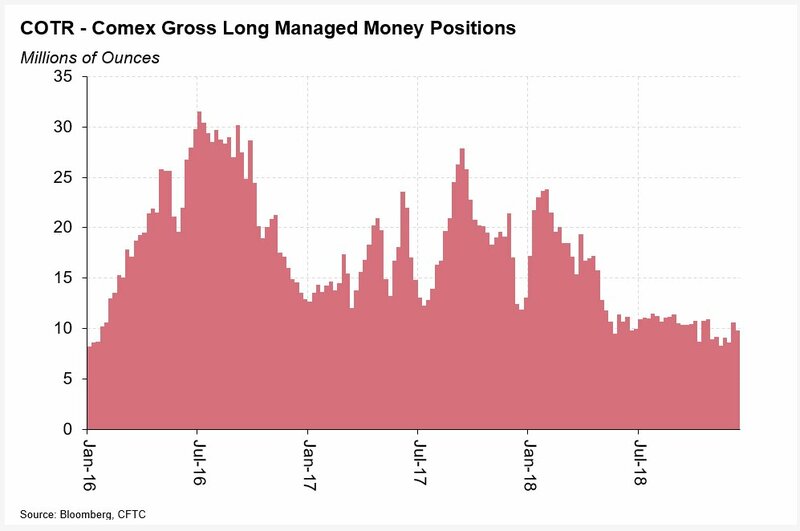 Gold: This was not due to new Managed Money longs coming into #gold, as this chart shows. 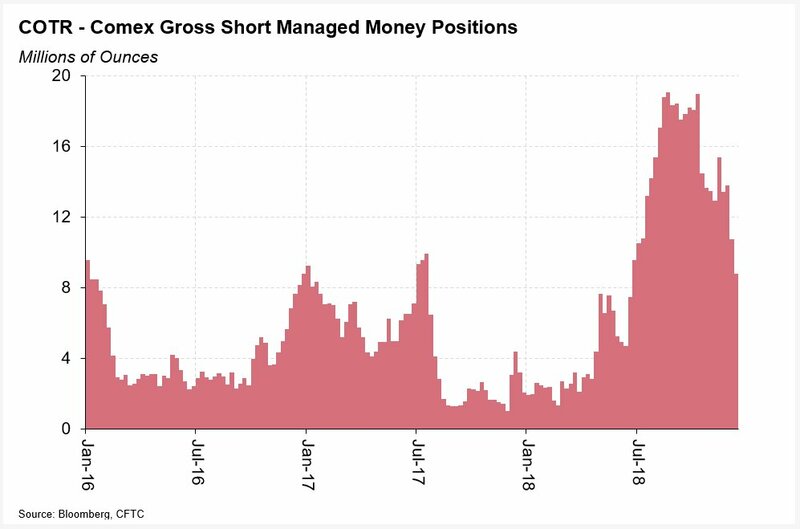 Gold: Rather this was due to further Managed Money short-covering in #gold. 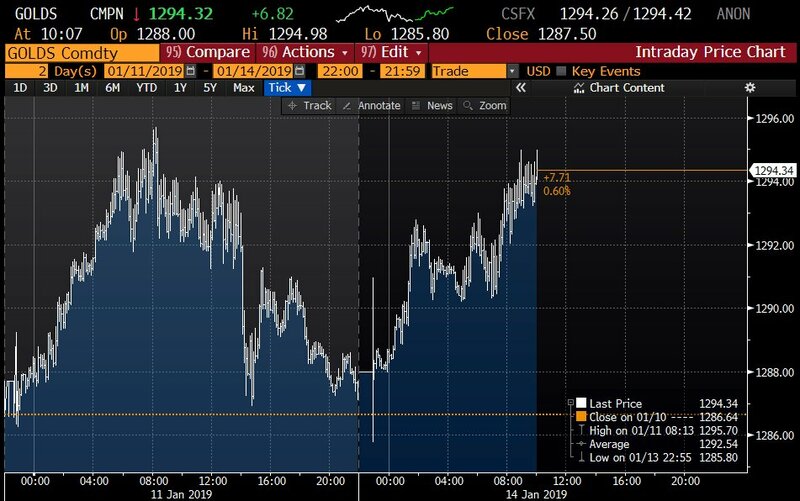 Gold: After drifting slightly lower on Monday, #gold has recovered much of this weakness and is trading around $1248.50/oz in early London trading on Tuesday. 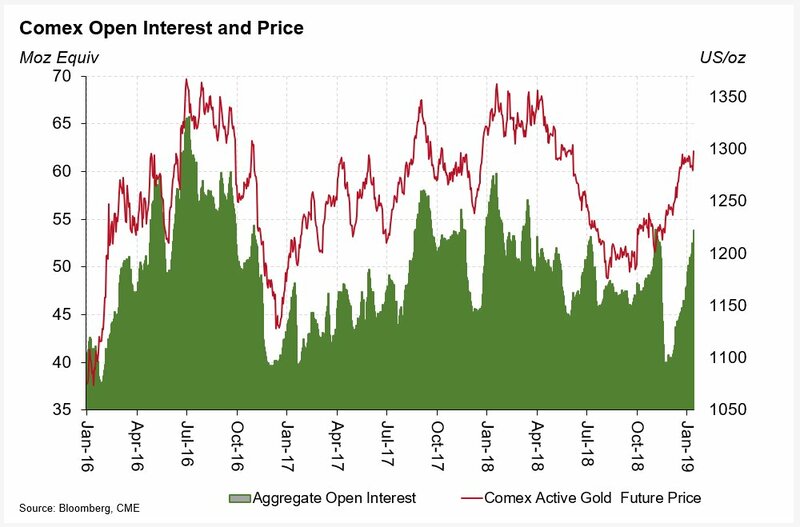 Gold: The delayed release of the COTR data from the CFTC saw changes in the week to last Tuesday 4 December, but considering the changes in Comex total open interest, not quite as large as I expected. Gold: The net managed money position in #gold was virtually eliminated (-0.2 Million ounces) as 2Moz of new longs entered the market and 3 million ounces of shorts covered. Precious Metals: There was one big topic at the @lbmaexecutive biannual dinnner last night - #Palladium. The remarkable rise of this precious metals and concerns about availability of metal dominated conversations. 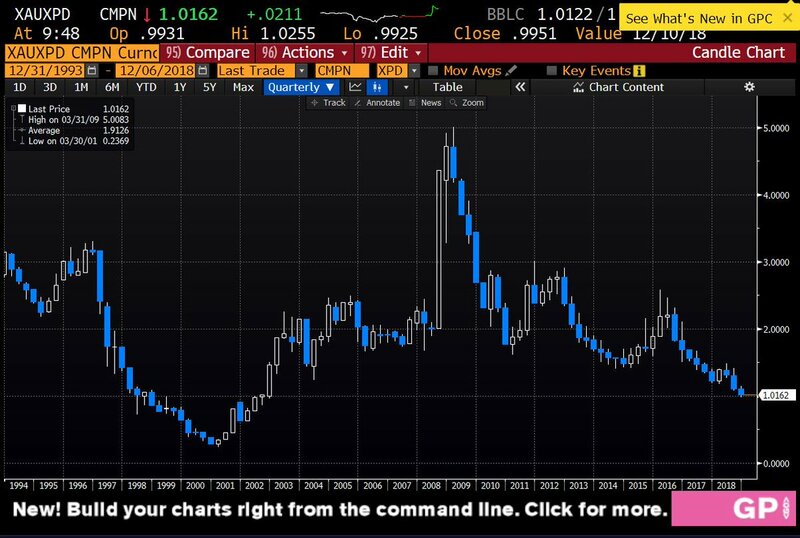 Many have noted that palladium was (yesterday) more expensive than #gold, but as this chart shows, that's happened before when palladikum surged on auto demand and a lack of Russian sales in the late 1990s. 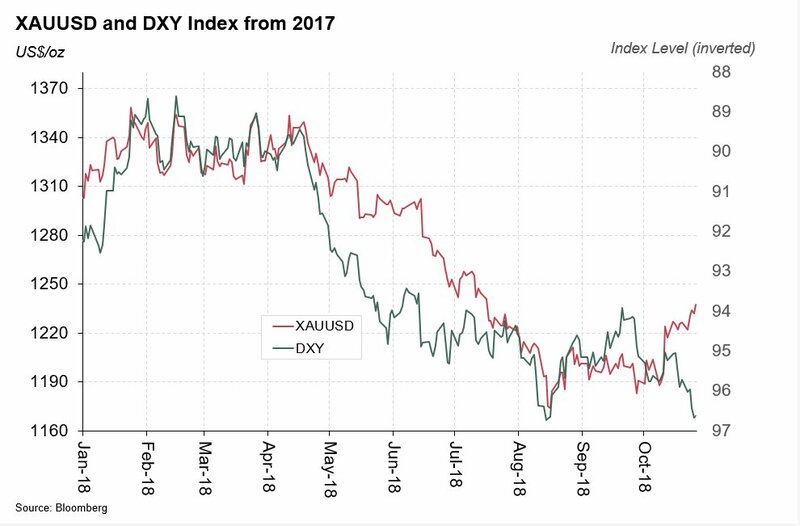 With slowing car sales in some important regions vs. an apparent shortage of metal immediately available, further volatility in palladium looks assured. 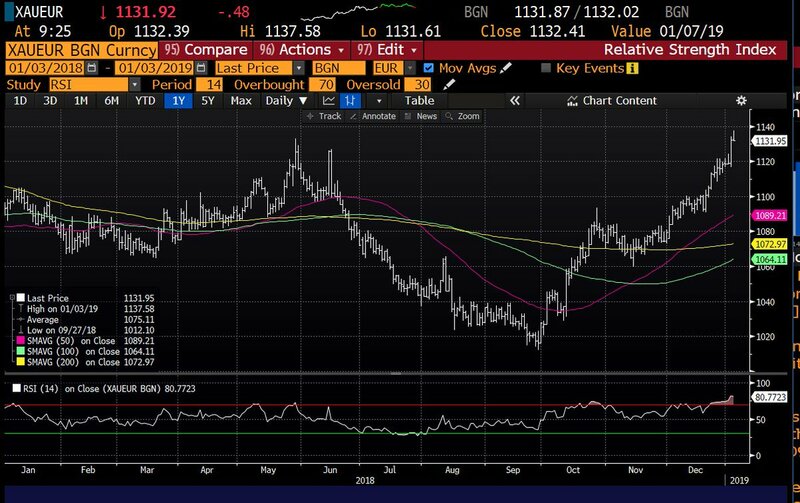 Gold: I’ve been on the road for the past fortnight and its worth catching up where we are now. #Gold hasn’t moved too much in the past fortnight, although its at the top of its recent range. 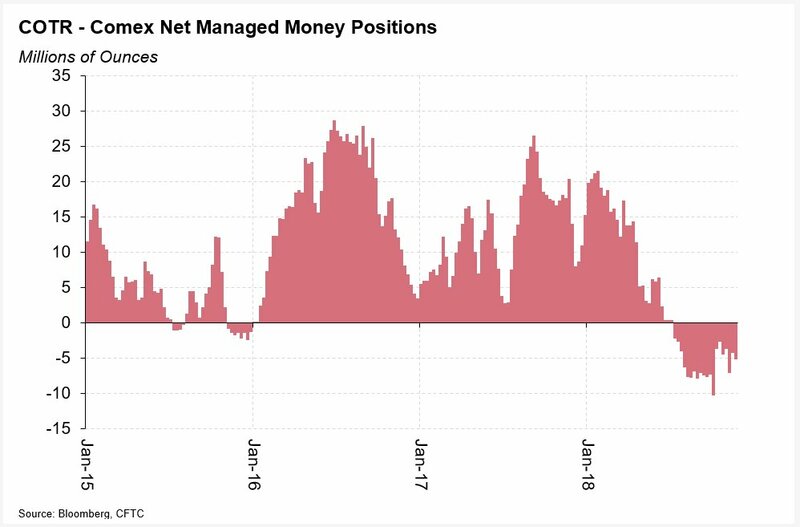 Gold: As of 27/11 the managed money position on Comex remained net short #gold. 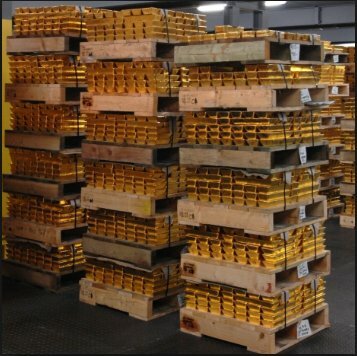 Why are Central Banks adding #gold to their official Reserves? Gold: Trading at $1221 this morning after #gold continued to drift lower yesterday. 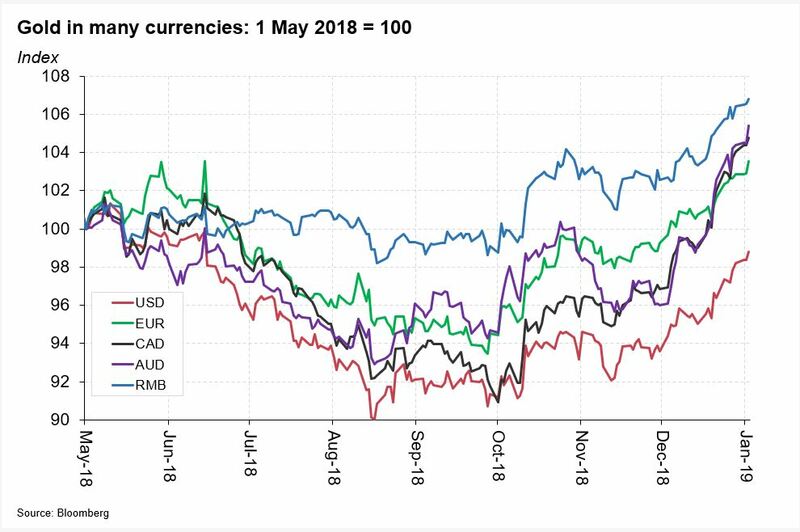 Markets continued to digest the US Midterm Election results and then the FOMC statement which signalled that a December hike is still on the cards. 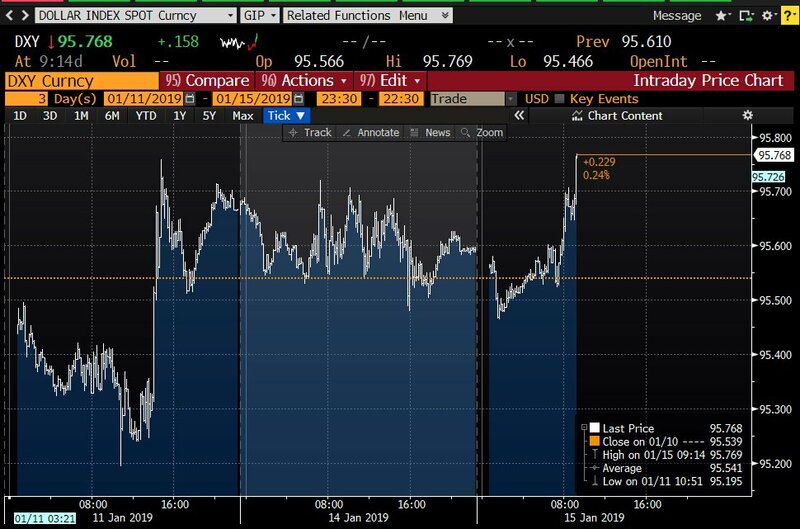 ...The smaller one that has opened up between #gold and the US dollar (here shown as DXY, which is a bit lazy, I know). 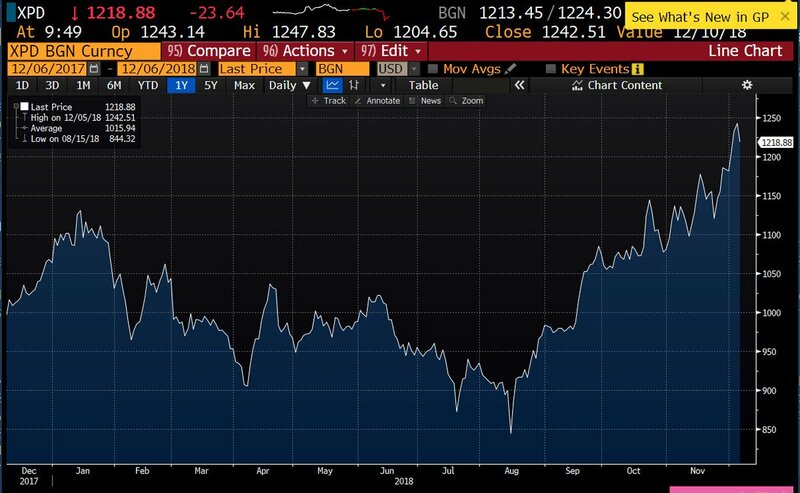 Gold: It’s been a tough few months for #gold since the middle of the year, but the past three weeks have seen signs of a recovery. Gold: And this recovery in #gold is even more pronounced in currencies other than the US dollar. Gold: This makes it an unusual rally in gold, as it is moving in the opposite direction to the US dollar - mind another gap, perhaps.